I made a couple of knives yesterday. Well, the handles, really. The blades were already here. OK, I only really re-handled a couple of knives. No big deal. I know. But one was re-handled with deer horn. The other with a blank from ‘old growth’ Fir. I putzed about all day making sure the tangs stayed in the handles and that the whole thing – when set up – felt ‘good’ enough to use. Can’t honestly say I did a great job. 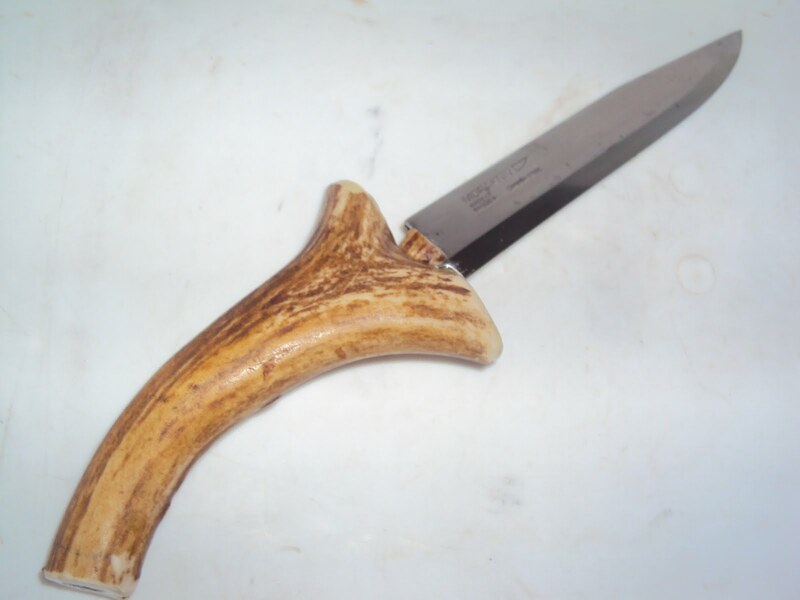 The deer horn knife is a bit weird. Sally had gone to the closest store, while I was handle-a’whittlin’ and all. The seas were flat calm so she took her own boat. The 15 horsepower pushes the little 11 foot Whaler along pretty well but she is a mere speck on the sea. Watching her disappear down channel was like watching a duck fly away. It was gone from the naked eye almost instantly. The little Whaler has a freeboard of only about six inches so a formidable ship she is not. I’ve seen longer surf boards. And I have definitely seen logs floating higher out of the water. To make me feel better, she took one of the dawgs. Fiddich is one goofy doofus but he is strong-like-bull and can swim like an Olympian free-styler. Once, when Sal’s engine conked out, he towed her to shore pulling the boat with the painter in his teeth. He’s good. He’s like a ‘kicker’. They got back an hour or so later and had only used a gallon and a bit of fuel. So that worked out pretty good. Still, she covered about 16 or so miles on the ocean in a bathtub and it can get nasty out there. I doubt that we’ll make it a habit. I mention all this not because it is interesting (tho, it may be a bit out of the ordinary for my ‘city slicker’ friends) but because it is healthy. Not just a few of my friends have been writing to tell me of their ailments and things and, while I sympathize and sadly also have to empathize, their burdens seem to have confined them to staying home and taking it easy. And medications. I am not so sure that is the right remedy. In fact, I recommend trying something different. Getting out in the forest works. It is remarkably healing in a weird, mystical, can’t-explain-it-kinda-way. Put more bluntly a day in the forest or on the water is worth ten visits to the doctor. In fact, I am pretty sure going to the doctor these days is just a big, bloody waste of time in most cases. What’s ailing us is aging us. It’s time. We’re just wearing out. Mostly, I think. The doctor gives you five minutes of their time and a piece of paper entitling you to pay too much for a legal drug. You know, like the LCB does only under a different ministry? After ten or so GP attempts prove futile, they might send you to a specialist who, presumably has more knowledge and better drugs. D’uh, why not go to the ‘smart’ doctor first?